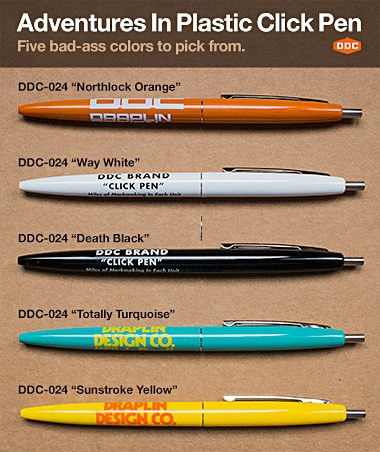 Draplin Design Co.: DDC-024 "Adventures In Plastics Click Pen"
Our favorite “Click” ballpoint pen. Offered in an array of spirited colors. Just that simple. Miles and miles of mark-making in each pen. Gu-aaron-teed. 02. Over 65 miles of writing in each unit. 03. Use it to make a gun. Just like in 5rd grade, man. 04. Make a deadly weapon out of it. 05. Make some kind of BB shooting contraption out of it. Wow. 06. Make a rocket out it and explore the far reaches space. 07. Go to prison, and make a tattoo gun out of it. ©2008 DDC Dry Goods Div., Merch Dept., Portland, Ore.